With the move to our new facility taking much longer than anticipated, we’ve had to bend a little with regard to surrenders and adoptions. Of course we’d much rather see chins go to happy homes than to have to take them in. 😉 Currently we have more than a dozen rescues waiting for their own special person. We have two new sets of females who appear to be receptive to other chinchillas. They would be excellent candidates for someone who has a lonely female and would like a small herd (trio) of their own. Trios are great! With a trio, should something horrible happen to one chin, two are left to console each other. We had a bit of an emergency situation this month where one of our follower’s lost one half of a pair. The remaining chin stopped bathing, was uninterested in food, and just generally withdrew. This is an emergency situation! In a case where a chinchilla mourns the loss of a cagemate, they can literally die of loneliness. This is especially true of chins who have had the benefit of a cagemate. Some chins respond better to a loss and thrive….but it’s just unnatural for a chinchilla to be alone. Which reminds me, we often hear people ask whether a chinchilla should go through a mourning period before introducing him or her to a new friend. The answer is “NO!”. Chinchillas are not people. They have no social need to show their respect for a dearly departed. They do not share the same psychological perspective as a human. When considering the needs of an animal, one must consider their needs as a species. This includes food choices, shelter accommodations, how we approach training, stimulation and socialization. As herd animals, chinchillas benefit from the proximity of those of their kind…assuming those in the social group are compatible! Males, with their instinctive drive to procreate, are much more difficult to pairbond. This is especially true if both males and females are in the same home. We have found that the brevicaudata chinchilla, the ones who are considered more “show” quality and have the big, fat body style, are the easiest to keep in groups. The typically pet store chins and breeder cast offs (more likely lanigera and costina) tend to be more aggressive towards their own kind and difficult to group. Again, working with their psychological framework, we can give them the benefit of matchmaking when we utilize spay/neuter surgery. This allows us to pairbond otherwise alpha males with a female or two and gives them a much better chance of adoption. Neuter surgery can be expensive and is not without risks. However, the benefits far outweigh the risk. To date, we have had but a single negative surgical outcome. Please know that neutering a chinchilla will not change their behavior as it does with other animals such as canines, felines and equines. Neuter surgery simply makes it impossible for them to reproduce. 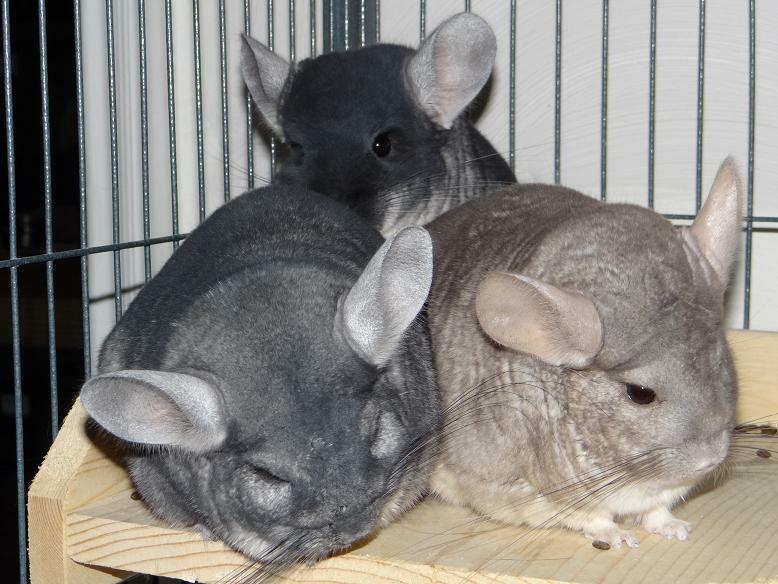 In the case of individuals who have both male and female chins, it is the responsible way to keep chinchillas without having to segregate them in separate cages. As a rescue facility, of course we advocate responsible pet ownership. We encourage chinnie pet people to choose a single gender pair or group, OR, to choose castration. And while we’re on the subject, those who think they can be quick enough to intervene during m/f playtime to obstruct a possible breeding are fooling themselves. It takes a millisecond for a male to impregnate a female chinchilla. Don’t be part of the problem.